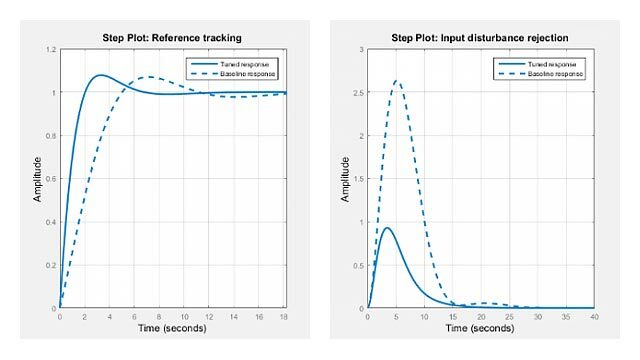 Control System Toolbox™ has commands for resampling dynamic system models or converting them between the continuous-time and discrete-time domains. This example shows how to use the commands for continuous/discrete, discrete/continuous, and discrete/discrete conversions. This example shows how to convert a compensator from continuous to discrete time using several discretization methods, to identify a method that yields a good match in the frequency domain. This example shows the comparison of several techniques for discretizing a notch filter. This example shows how to improve the frequency-domain accuracy of a system with a time delay that is a fractional multiple of the sample time. This example shows how to convert a discrete-time system to continuous time using d2c, and compares the results using two different interpolation methods. Choose discretization and interpolation methods for converting between continuous and discrete models. This example shows how to upsample a system using both the d2d and upsample commands and compares the results of both to the original system. Use resampling commands to change the sample time of a discrete-time system.